[Salem, Mass.] The results of the US presidential election, at first considered clear and decisive, were thrown into utter chaos late Wednesday morning as a new electoral college map appeared at an independent primary school on the outskirts of Boston. 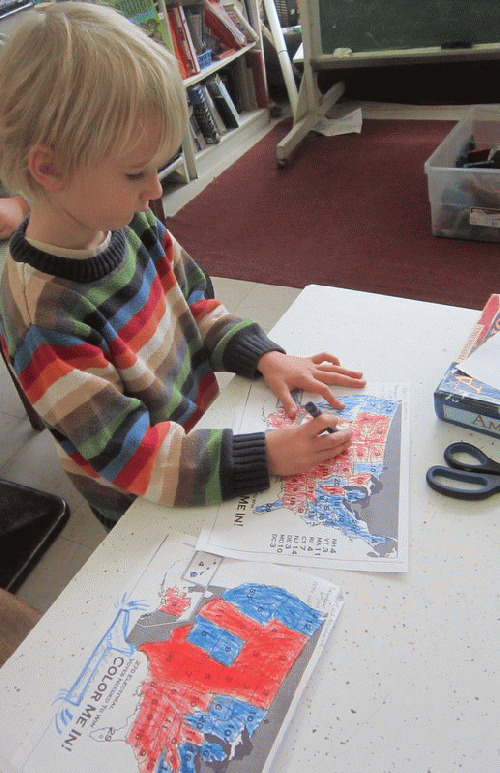 "We were just coloring in the maps," said the young boy's teacher, "and he goofed." The mistake, innocent though it was, is already having wide-ranging implications. Ohio and Wisconsin, once considered solid "blue" victories, were instead colored in red. Although West Virginia and Kentucky were mistakenly filled in blue, the difference was not enough to change the result back to the map voters saw when they went to bed the night before. The astute youngster quickly realized his mistake, saying only "I thought these were supposed to be blue and those were supposed to be red. Oops." With that one word, [name redacted] elevated himself to the eloquence of erstwhile GOP candidate Rick Perry, whose similar 'oops' during one debate earned him the support of several close friends and family members. And with such a straightforward explanation of the new electoral map, observers far and wide realized the boy must be onto something. The Carter Center, long a critic of the abomination that is the US election system, immediately issued a statement urging support for the new map on the grounds that it is likely to be at least as reliable as the official result. "We always felt that four-year-olds were best positioned to understand the US' arcane electoral college setup," said the former President and now champion of "democracy." [Note: definitions vary on this quaint and archaic notion. Some sources refer to it as a form of government, others as 'a type of Greek pastry.' --Ed] "They're they only ones who can make any sense out of it." What could happen next is anyone's guess. No organization or political faction has yet stepped forward to claim responsibility for the mishap, though speculation is rife among rife speculationists that the young lad may be on the payroll of one of the CIA's jihadist mischief-making factions. Confusion reigned in Washington as well, where outgoing Secretary of State Hilary Clinton just can't figure out who should be bombed as a result of the election fracas. "There are so many targets, and so little time ..." she mused. In the spirit of bipartisanship, Clinton received support from unexpected quarters in the form of a warm statement from former Secretary of Everything and noted War Criminal Henry Kissinger. "We don't always agree, but she usually bombs the right people," said the aging genocidal maniac. "I mean, we all basically follow the same rules. In fact, I was quite touched to hear that when Hil is stuck for a solution, she and her advisers ask themselves 'Who would Henry bomb?'" Florida officials may have inadvertently caused the confusion by going to bed instead of finishing their vote count on Tuesday night. "He just woke up from nap and thought he was supposed to finish it," said King's teacher. "He's a very precocious young man." Russian and Chinese interests so far are cautiously silent on the matter. More later as it develops.